Our success rate at Gobble n Grunt outfitters is second to none. It can be summed up quite simply: Everyone gets their opportunity. If not, you come back on us within 2 years for a 1 bird hunt. Since 2002, we have maintained a 2 bird success rate of 182% with 225% shot opportunity! A one bird success rate of 95% with 142% shot opportunity. This is counting every hunter!! Every young kid shooting his/her first turkey, every elderly hunter shooting his/her last turkey, every handicapped hunter, every bowhunter, every black powder shotgunner who's gun misfired, every hunter who didn't feel well enough to hunt some days, everyone who skipped out early for business or personal reasons........everyone. 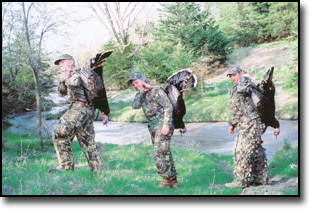 If you take out all of the folks who left camp early for one reason or another and did not hunt a full three days, then only one out of nearly 1000 hunters whom we have hosted in all of our turkey camps since 1991 did not harvest a turkey.............now you can see why we have our turkey hunt guarantee. It's pretty hard to do any better than that unless you start shooting them out of a cage! *Prior to 2002 we did not keep records. At that time a non-resident could only get one tag. We did a handful of turkey hunts per year during that time and all tags were filled every year going back to 1991. Hunt where success is expected.